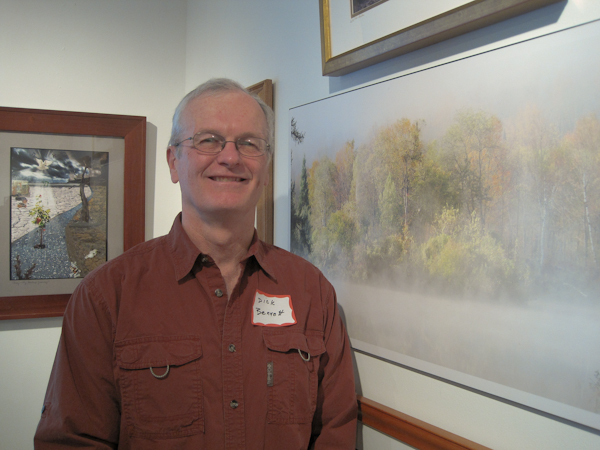 Call for Submissions: High Falls Gallery "Photographer's Path 14"
Our second exhibit of 2011 is Peter's Picks 2008-2009: A Retrospective. For the last three years, Peter Marr, has made "picks" from each of our shows from the work of the featured and guest photographers. We post with each selected photograph Peter's brief article where he describes his choice. It is a popular feature of each show and those selected are honored with "Peter's Picks". In the current show we have invited the selected work from 2008 and 2009 back in a retrospective exhibit. Peter also has an exceptional exhibit of his nature photography. In the East Gallery, fine photographs by Jesse Thayer feature his work and experiences from three continents. Additionally Sarah Adkins and Martin Nott are guest photographers. Camera Rochester members with their winning photographs from their competitions are Jim Burton, Ron Gouger, Jerome Kaye, Steve Malloy-Desormeaux, Sheila Nelson, and Wu-Hsiung Yang. Note today, February 4, is First Friday Gallery Night. The Gallery will be open 11am to 9pm. In addition to the retrospective picks, Peter Marr has selected three photographs by the guest photographers in the current show. We have excerpts from his discussion here in the newsletter. You will want to go to the webpage link to see larger images and Peter's full write-up, or, certainly better, be sure to visit the gallery to see them in person. In selecting Jesse Thayer's The Boy - Zagreb, Croatia, Peter commented " We know that we are observing a father and his young son, and the artist has carefully chosen a camera angle, where the father's head is completely obscured by the boy, who in turn has his back to us. It is very evident that the power of this photograph produces a communicable meaning, and as George Tice so importantly stated, 'The question is not what you look at, but what you see.' Here we have an ideal opportunity for each viewer to envisage, reminisce, and perhaps recreate a past memory, of when they may have been in a similar situation. For myself, I would like to think that the father is recalling past experiences and memories that he has had in Zagreb and it surrounds, but certainly not just reflecting on the past, but offering counsel on what the future may hold for his son......"
Peter observed with his choice of Fairport Sunset by Sarah Adkins that "The real fascination with this warm, uplifting print, is that incredulously, there is not a single person around to experience this memorable picturesque setting. It is as though the approaching sunset has signaled the end of the outdoor festivities, and relegated everyone to life indoors for the evening, thereby sadly missing out on one of nature's grandest finales. Even the houseboat occupants seem to have closed up shop, leaving a few reminders of their daily activities on top the 'deck'. Certainly, there is a tinge of sadness in that no one is around to experience this beautiful panorama, except thankfully the artist, who has recorded this lovely scene for all of us to admire at our leisure. 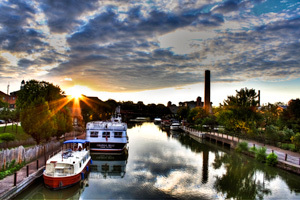 The Fairport canal has never looked so calm, warm and gladdening as it does in this delightful image." In the choice of Martin Nott's photograph, Peter noted, "I decided on Strada Caprizio, mainly because the longer that I looked at this print, the more that I enjoyed this masterly glimpse at a small sliver of Italian street life. I love the soft lighting and the delicate range of pastel colors, although like every viewer of this intimate scene, one has to be aware, and be jolted by, the bright cyan-blue plastic shopping bag the lady is carrying. Certainly we are all aware that this bag is congruous with our current time and fashion period, but happily, we can quickly switch our attention to the imposing older gentleman, who is most surely fully concentrating on coaxing his violin to produce the most satisfying sound. 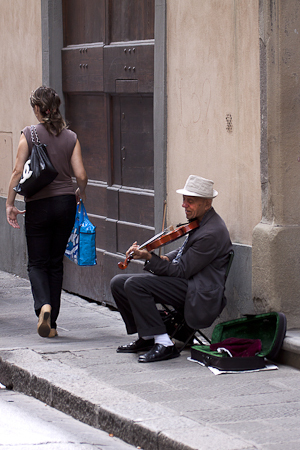 What is absolutely fascinating about this street scene, is that the man is well-dressed, as clearly evidenced by his well-kept suit, together with his tie, hat, shoes and white socks, all of which are seemingly of impeccable quality, and definitely not indicative of someone seeking monetary rewards for his musical talents. Furthermore, his old, but treasured violin case is placed on a paper support for protection, but it is definitely left in an open position, probably to welcome any contribution from any grateful passer-by, but only for a just gratuity for his artistic talents. The violinist's face exudes warmth and dedication, and I would believe that he sits in this spot for many hours a week, giving enjoyment to all who pass by. Contrast his benevolent demeanor with that of the young lady, who passed by oblivious of his presence or his music......."
Looking ahead to our next exhibit we are pleased to mention that Larry Merrill will be exhibiting in our East Gallery from February 23 - March 20. This will run concurrently with his exhibition at the George Eastman House, Looking at Trees, which is up now until June 12. Merrill will also be giving a talk at the Eastman House on March 10, at 6:00 pm in the Dryden Theater. It is Larry's second solo exhibition at the George Eastman House and he has had numerous exhibitions in the United States over the last 30 years. His work is in the public collections of 16 noted museums and galleries including the Yale University Art Gallery and the Museum of Fine Art, Houston, TX. 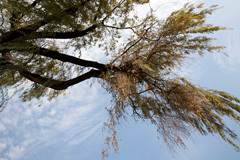 You will certainly want to visit both exhibitions as we turn our attention to Spring Looking at Trees. All local photographers will be pleased to learn of another wonderful opportunity to submit work for the juried show A Photographer's Path 14, an annual survey of photography from our area at High Falls Gallery. In its 14th year, it is always a great exhibit at Rochester's official visitor center where the art exhibits add a bit of extra vitality to the permanent displays. Click Here for a PDF documenting the details and the entry form. Submissions are to be dropped off on February 16 - 20. The exhibit will run from March 20 to April 29, 2011. For questions contact Sally Wood Winslow at High Falls Gallery 325-2030. Sally's warm invitation concludes "We hope one hundred artists will join together at drop-off to celebrate our tradition of fine art photography. We invite you to be one of them!" Capture Rochester books, at Image City and other locales around Rochester including the High Falls Gallery and Dark Horse Coffee. I create and sell note cards of my images and I am also available for portraits and events. Strong side lighting can produce deep shadows and provide excellent lighting for making dramatic images. The side lighting that occurs just after sunrise and just before sunset produces the longest and deepest shadows for that day. These shadows can totally change a mundane ordinary landscape into a truly extraordinary landscape. Side lighting also maximizes the effects of using a polarizing filter. Glare is reduced and colors become more saturated when a polarizer is used. The combination of deep shadows and saturated colors can be used very effectively to produce powerful imagery. 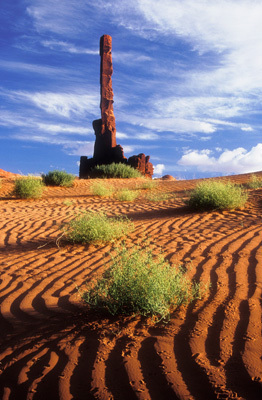 My example image entitled Sand Ripples at the Totem Pole was made just before sunset in Monument Valley. At this time of day the deep shadows in the troughs of the ripples contrasted beautifully with the brightly lit peaks of the sand ripples. In capturing this image I moved to a position where the shadow lines would act as lead in lines to the Totem Poles. I also maneuvered my tripod and camera to distribute the green tumbleweeds aesthetically. By observing the length of the shadows produced by the tumbleweed plants you can get a feeling for how low the sun was in the sky. A few minutes after making this image the sun went below the horizon and the drama of the scene was lost. Camera Obscura for artists appears around 1519. Daguerreotype invented by Louis Daguerre in 1829. William Henry Fox Talbot invents Calotype in 1839. The first "How To" book written in 1849. I just finished reading the first book on how to take a photograph. The title is History and Practice of the Art of Photography; Or The Production of Pictures Through the Agency of Light. Containing All The Instructions Necessary for the Complete Practice of the Daguerrean and Photogenic Art, Both on Metallic Plates and on Paper. Henry Snelling wrote the book in 1849. The book contains chapters on the Theory of Light, a brief history of the Art of Photography, and what type of paper and chemicals one should buy, plus other helpful hints. Or as Mr Snelling states: "Everything essential, therefore to a complete knowledge of the whole art, compromising all the most recent discoveries and improvements down to the day of publication will be found herein laid down." Not even Scott Kelby could make a statement like this. There are many interesting tidbits in the book. Here is one I did not know: According to Mr. Snelling "It is to Professor Samuel F. B. Morse, the distinguished inventor of the Magnetic Telegraph of New York, that we are indebted for the application of Photography, to portrait taking." It seems that Professor Morse meet Mr. Daguerre in Paris and brought back one of the first cameras to America. When Professor Morse was not experimenting, he spent his time taking portraits and writing about how to improve the craft of portraiture. On the practice of the art of photography Mr Snelling states: "Impatience is a great drawback to perfect success, and combined with laziness is a decided enemy. Besides this, no one can excel in Photography who does not possess a natural taste for the fine arts, who is not quick in discerning grace and beauty...." My interpretation of this means only the upper class is capable of taking good images. The book is full of interesting hints and ideas for the fledging photographers of 1849. It also has many insights for us. If you ever get a chance, read this book. You can find it some libraries or as a free E-reader download from Amazon and from the Project Gutenberg web site. Each month, we have had a good turnout for Image City Critiques, our free program at the Gallery to provide participants an opportunity to engage in a friendly, constructive, and positive critique and review of their photographs. The sessions are held on the first Wednesday of the month. Join us for the next on Wednesday, March 2nd from 7:00-9:00 pm. Please bring 2 or 3 jpg images or prints. Images may be on a CD or on a thumb drive and should be sized at most 1MB in size and at most 1500 pixels on the longest side. If you have any questions please contact Don Menges (dmenges@rochester.rr.com) or Gil Maker (gmaker@mac.com). We look forward to meeting with you on Wednesday, March 2 at 7pm. February 23 - Peter's Picks, Part 2 Opens, with Looking at Trees by Larry Merrill in the East Gallery, guest photographer Susan Kaye, Camera Rochester, and a Special Thaw exhibit.